The life of a royal princess is often an unhappy one, destined to be a pawn in the shifting alliances among nations, forced to leave her home, and family to live in a foreign country where she more often than not didn't know the language, isolated from anything familiar, it was a wonder more of them didn't go bonkers from the strain and tension they were under. 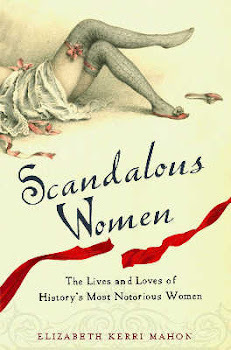 For every Eleanor of Aquitaine, strong-willed and more capable than most men, or Catherine the Great in history, there were princesses like Catherine of Braganza and Maria Theresa of France who found their place at court usurped by a revolving door of glittering mistresses. And then there was Caroline Mathilde, Queen of Denmark, married off to her first cousin Christian VII at the tender age of 15. Born postumously to Augusta, Princess of Wales after the unexpected death of her husband, Frederick, Prince of Wales, Caroline Matilda grew up at Kew and at Leicester House in London. Having never known her father, she didn't lack for substitutes in her four brothers. By most accounts, she had an idyllic childhood which ended abruptly with her bethrothal to Christian VII. The Danish Ambassador did quite the snow job, convincing the Princess's brother George III that Christian was a sober, amiable virtuous Prince, the model King but it didn't really matter if he barked like a dog, the marriage was to shore up the traditional ties between the two countries, the check the power of France and to strengthen the Protesant religion. 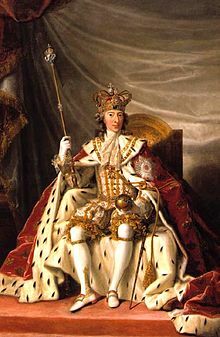 No doubt George III though that Caroline Matilda should be flattered that she would get to be a Queen, since her eldest sister Augusta had to settle for the Duke of Brunswick. The royal couple were married by proxy in October of 1766, her brother standing in for the groom. 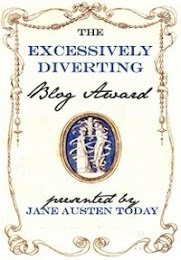 Caroline sobbed through out the ceremony, and she sobbed all the way to Copenhagen. It would have been amazing if she had any tears left to sob when she met her husband for the first time. King Christian of Denmark was not only cuckoo for coco puffs but he didn't even want to be king. He looked like a child, slender, with hair so pale that he didn't need to powder it. As a boy, Christian's tutors had beaten and tortured him, trying to make a man out of him. 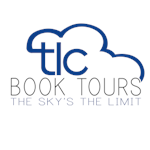 In order to survive Christian had retreated into a fantasy world, filled with strange dreams. He had inherited the throne at the age of 17, and after a good start, he became bored by the responsibilities, leaving piles of paperwork unread for days, while and his companions spent their time playing practical jokes. At night he spent most of his time in the brothels of Copenhagen, and indulging his taste for destruction. He also was known to be violent towards women, but the courtiers at the royal court felt that he would settle down down once he got married. Caroline Matilda had been raised far from court and had no idea how to navigate the complexities of court life. Like Marie Antoinette a few years later, she was not allowed to bring a single lady in waiting with her from London. Only her trousseau and a letter from her brother to read, lecturing her on how to behave as she traveled on the royal yacht. The one friend she did make, Louise van Preussen, was sent away in disgrace. The viper in the nest was Christian's step-mother Juliane-Marie, who in the incestuous ways of European royalty was the sister-in-law of Caroline Matilda's sister Princess Augusta. Juliane-Marie was a stiff-necked pious woman whose one goal in life was to see her own son on the throne. It was reported that she had even tried to poison Prince Christian as a child, but he was saved by a quick thinking maid. If Caroline Matilda had hoped to find a sympathetic mother-in-law, she was barking up the wrong tree. At first Caroline Matilda had hope that her marriage might be a success after all. Christian, entranced by his new bride, rushed to embrace her when they first met. His ministers breathed a sigh of relief. But within days, Christian decided that he didn't like being married. He went back to his old bachelor ways of hitting the hot spots with his entourage, destroying patterns and picking fights. Caroline Matilda was unhappy and discontented, and made sure her brother knew it in her thinly veiled letters. However, she made it clear that she didn't want or need his advice, that she would rely on her own judgement. Caroline applied herself to life at court, learning Danish. Bored with being cooped up in doors all day, she took to walking the streets of Copenhagen accompanied by a footman and lady-in-waiting. Since the Prince refused to come to her bed, she couldn't even fulfill her most basic role, giving the kingdom an heir. 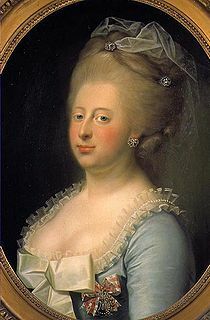 Caroline Matilda while not beautiful was charming and vivacious. Buxom and blonde, she had a peaches and cream complexion that was the envy of many. While her husband wasn't interested, there were plenty of men at court who were, and would have been more than happy to console the depressed Queen. It was only the quick thinking of Christian's ministers that saved the day. They whispered in his ear that the lack of an heir might convince his subjects that he was impotent. That was enough to get her husband back in her bed long enough for her to concieve the long awaited heir who was named, what else, Frederick. Still the birth of an heir did nothing to change Christian's louche ways or to stablizie his mental instability. In fact he was getting worse. While traveling incognito through Europe to England, Christian met a German doctor named Johann Struensee, who had been investigating mental disorders. He seemed to have a soothing effect on the King. Christian was so taken with him that he insisted that Struensee come along for the rest of the tour. At 30, the King's new friend was handsome and ambitious, almost six feet tall, broad-shouldered with piercing blue eyes. Streunsee, who had been toiling in the provinces, seized his chance to make a name for himself. He had a calming effect on the young prince, mixing up hangover remedies, coaxing him to take an interest in his paperwork. His prescription of fresh air, exercise, and cutting back on the drinking which began to work wonders. Struensee affected a modest and humble demeanor but anyone who bothered to delve deeper would ntoice the raw ambition lurking in his deep blue eyes. He won over Caroline Matilda after he treated her for what Eleanor Herman believes might have been a particularly painful venereal disease caught from her husband. He listened to her, the first person to do since Louise von Preussen. Ecstatic to have a friend, soon Caroline Matilda demanded that Struensee come visit her everyday, sometimes 3 or 4 times a day. It was a classic case of a young, romantic girl falling for an older, experienced man. Struensee was lover, teacher, and father figure all wrapped up in an alpha male body. He soon realized how he could turn the situation to his advantage to have not just the young King but also his Queen dependent on him. On Struensee's suggestion, Caroline Matilda took up riding, becoming a fearless horsewoman. He now began phase two of his plan, to convince her to become more politically active. He told her that it was only a matter of time before Christian was no longer sane, and that it was up to her to seize the reigns of power before her enemies did. By 1770, Struensee and Caroline Matilda were lovers. For Caroline Matilda, Streunsee must have seemed like a knight with a stethoscope. After the fumblings of her husband, to made love to by someone who knew what they were doing must have been a revelation. Happy and in love for the first time, Caroline Matilda could afford to be compassionate towards her husband. Christian, far from feeling betrayed, was quite happy that his wife had someone who could fulfill her needs. There were now three of them in the marriage, but none of them seemed to mind. Christian was comfortable in the company of his wife and physician, he became uneasy if they weren't around. Struensee dined with the royal couple several times a week. While Caroline Matilda and Struensee saw to matters of government, the King could live in his own little world. He only roused himself long enough to sign his name to official documents. Matilda was so happy, she turned a blind eye to her lover's ambitions and to his other affairs. Encouraged by Struensee, she even began dressing in men's clothing, wearing buckskin breeches, vest and coat, her hair hanging down in a braid, riding astride like a man. Christian, Matilda and Struensee moved to the secluded palace of Hirscholm, on a island not far from Copenhagen. There Caroline Matilda gave birth to a daughter named Louise in 1771. The pregnancy and birth was such a secret, that the people of Denmark were suprised to eventually learn they had a new princess. No one at court however was fooled about who the father was, every one knew that it was Struensee although Louise was raised as a Danish princess. Caroline Matilda appointed him her official reader and private secretary to the King, which made him a councilor. Streunsee was determined that Denmark be a modern up-to-date nation, able to compete with the rest of Europe. Unfortunately he alienated not only the clergy and nobility, powerful enemies who were appalled that this upstart German nobody was taking away their rights and privaleges. 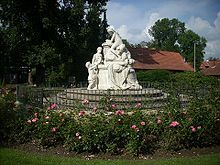 They found a welcome ear for their complaints in Christian's stepmother, Dowager Queen Juliana, who hoped that once she got rid of Struensee and Caroline Matilda, would rule as regent until Christian's son came of age. Soon Caroline began to believe that she and Struensee were another Catherine the Great and Potemkin, but she had neither Catherine's intelligence nor her political savvy. He let power go to his head, luxuriating in the trappings of power. He made himself a privy councilor and a count, ordered a new gilded carriage, and ordered his servants to wear uniforms. Meanwhile their enemies at work, compiling evidence of the affair. They sprinkled powder on the secret staircase between Struensee's room and Caroline's to check for footprints. Armed with proof, Struensee and Caroline Matilda were arrested one night after a masked ball. Christian had been forced to sign warrants when Juliana told him that a revolution was forming against Struensee and the Queen, and that the palace was about to be stormed. Caroline Matilda was kept away from her husband, to keep her from convincing him of her innocence. She was allowed to take little Princess Louise with her to her prison at Elsinore but not the Crown Prince who she never saw again. When George III heard of his sister's adultery, he didn't lift a figure to help her. He ignored all her pleas and burned her correspondance. Her lover meanwhile was tortured under interrogation. Struensee only confessed after being told that Caroline Matilda had been arrested and confessed. They then went to Caroline Matilda and told her that her lover had confessed to everything. At first she didn't believe them, until she saw his signed confession. She herself only signed a confession hoping that by doing so, Struensee's life might be spared. At her trial, she was found guilty and divorced from her husband. Despite her divorce, both children were considered legitimate. Struensee was executed on April 28, 1772. 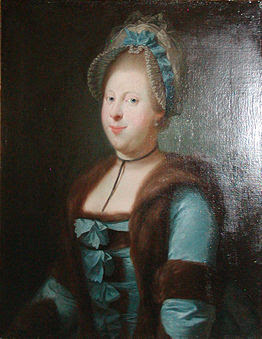 Caroline Matilda was sent into exile in Hanover at Celle. Despite her exile, she never stopped hoping that she would see her children again. She gave card parties, did needlework and went to church. On May 11, 1775, she died of scarlet fever at the age of 23. Hearing of her death, George III refused to let her be buried in Westminster Abbey. Instead she's buried next to her great-great grandmother in Celle. Her son ruled Denmark as King Frederick VI. 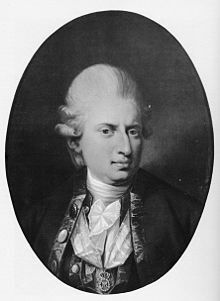 While Caroline Matilda deeply loved Struensee, the question remains whether he loved her or was it just ambition on his part? The answer may life in what he said when he discovered that Matilda had confessed "The person I loved best in the world.... What have I done....disgrace....shame." WOW! This is a woman I'm totally unfamiliar with -- what an incredible life -- so much tragedy -- and then, to die at 23?! Insane. I'm glad that you enjoyed the post. George III's siblings gave him a great deal of agita, both of his brothers married commoners, one of the reasons for the Royal Marriage act. I'm amazed that he did nothing for his sister but that's royalty for you. The poor girl had no idea what she was getting into when she got married and had no real support until Struensee arrived. It's no wonder she fell in love with him, he must have seemed like a Savior. I remember watching a documentary about Caroline Matilda several years ago. What a sad story. I'm glad I'm not a princess who had to have an arranged marriage! I read an excellent book many years ago about Caroline and her life- I wish I could remember the title or author. Hester Chapman wrote another non-fiction book about Caroline. Norah Lofts wrote a fiction book and there is also one by a Swedish author that is available in an English translation, I think its called the Queen's Physician. Love the background color...;). Excelent information...that was pure love....I saw the movie The Royal Affair, it was great. I read and saw so many different accounts. This is history. Why the inconsistencies?? I really really enjoyed your post! I had just watched A Royal Affair and found your blog, wanting to read more about Caroline Mathilde. 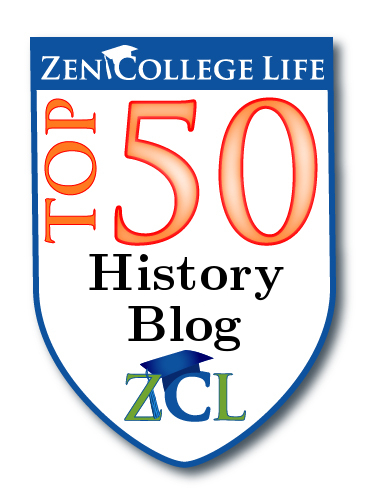 I am a historical researcher and am writing about the House of Hanover. I am interested in Sophia Dorothea of Celle, George I's wife. Is this the ancestor by whom Caroline Mathilde is buried? So awesome to read this! I heard stories of an ancestor being beheaded for sleeping with a queen as a child but never new which queen or any other details. Thank you for the peek into my family's past! WOW! Such an intriguing story. Similar to another commenter, I also saw the movie A Royal Affair and wanted to read more details. Thank you for sharing/posting. Fascinating story. I watched the Danish film A Royal Affair last night. It was excellent. I had never really heard of Caraline or Christian or the Doctor before. Very sad story. Again showing the terrible outcome of these arranged marriages between European and British royalty. The King was mad bad and cruel.His Mother wicked. Whatever Whatever may be said about Edward 8 and Wallis Simpson he was brave and perfectly within his rights to marry the woman he loved than a loveless marriage with some Princess or other and risk having a child that might turn out like Christian or any other mad cruel royalty due to marrying their close relatives. Sad to think Caroline died so young bit like Princess Diana may she rest in peace.